A few years ago, I had a bit of a love affair with Primark nail wraps; they were so cheap and offered surprisingly OK for the price. Unfortunately, they stopped selling them and I never really found another brand that could replicate that love. DinkiBelle has surpassed it. 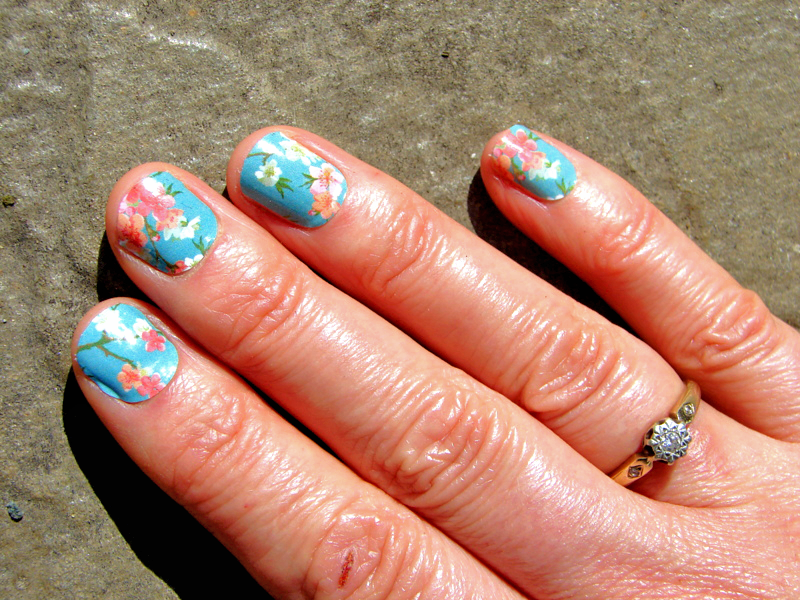 As my nails have some odd defects from dermotillomania damage and I feel too embarrassed to show them on this blog, I tried these out on my lovely mum, who agreed to play hand model for this post. 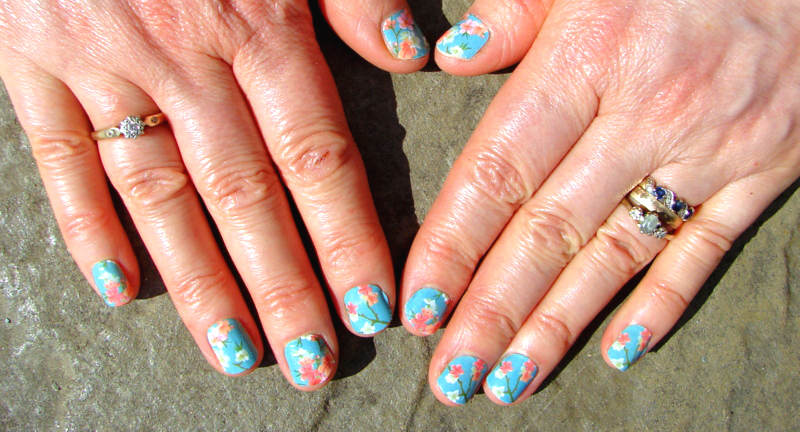 We tried out the design 'Spring Blossom' -part of their Spring 2016 range- although there are a number of equally gorgeous designs on their site. I love the look of 'Seafoam Sparkle', 'Naked Daisy', 'Dizzy Dots' and they even have the ultimate blogger nail wraps....MARBLE. Application of these nail wraps were so easy. Making sure your nails are clean of all varnish, buffed and filed, just select your nail size from the row of wraps and take it off along with the plastic layer which protects the stickiness. Place the rounded end of the nail wrap just about the cuticle and smooth the rest of the wrap down, making sure there are no crinkles or bubbles (this is easier to do than it sounds, trust me). You'll find there is a lot of excess wrap hanging over the edge, so just take a nail file and, filing in downwards motions rather than across, file off the excess. It'll more likely score the wrap, meaning you can just pull the excess off rather than filing for ages until it comes off naturally. Do any filing that's necessary to neaten up the edges, and voila! That's literally all you need to do. 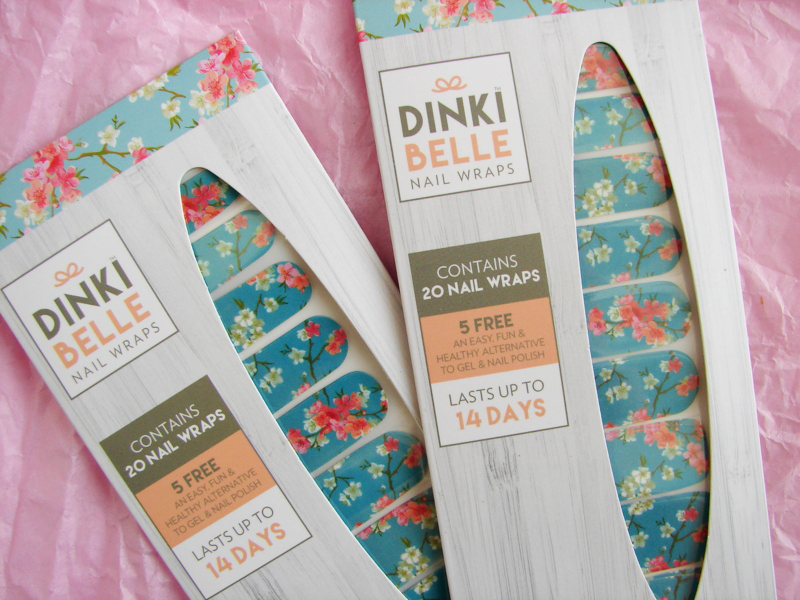 You get 20 nail wraps in a pack, so there's no need to worry about there not being a size that fits your nails; DinkiBelle has all sizes covered! I think these are such a great alternative to damaging false nails as these wraps are just as quick and easy to apply, and they last so much longer than false nails would! 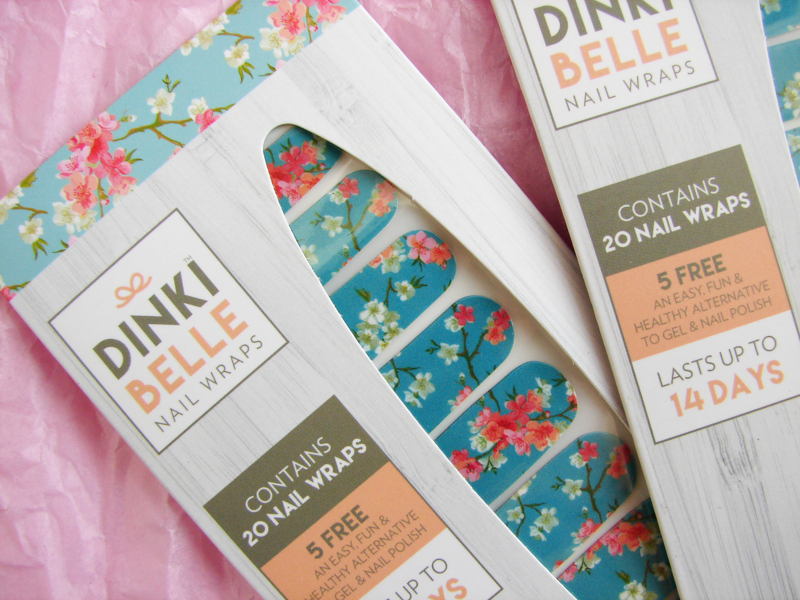 DinkiBelle state that the wraps can last up to 14 days and my mum can totally vouch for that. After about two weeks, she eventually took them off herself to change up the design, but they were still going strong! At around the two week mark, the first small chip appeared, but for someone who is always on the go, these wraps did an incredible job at holding up; not a scratch, chip or peeling effect in sight. I'm very impressed! It also saves the hassle of waiting for your nail varnish to dry and (inevitably, if you're like me) smudging it straight afterwards. The nail wraps are free from toxins which are often found in other nail varnishes, such as formaldehyde, dibutyl phtalates, toluene, camphor and formaldehyde resin, making them a great choice for anyone who is cautious about which beauty products they use. 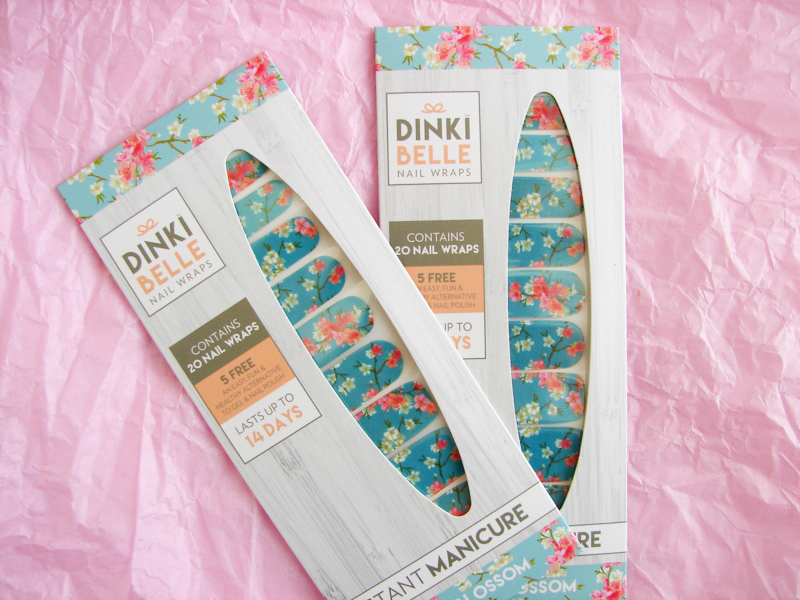 Toxin-free, easy to apply, long-lasting and beautiful designs...I think DinkiBelle nail wraps are going to be a perfect way to get fuss-free nails this summer! Head over to my Twitter (@pretty_polishd) tomorrow for a giveaway! 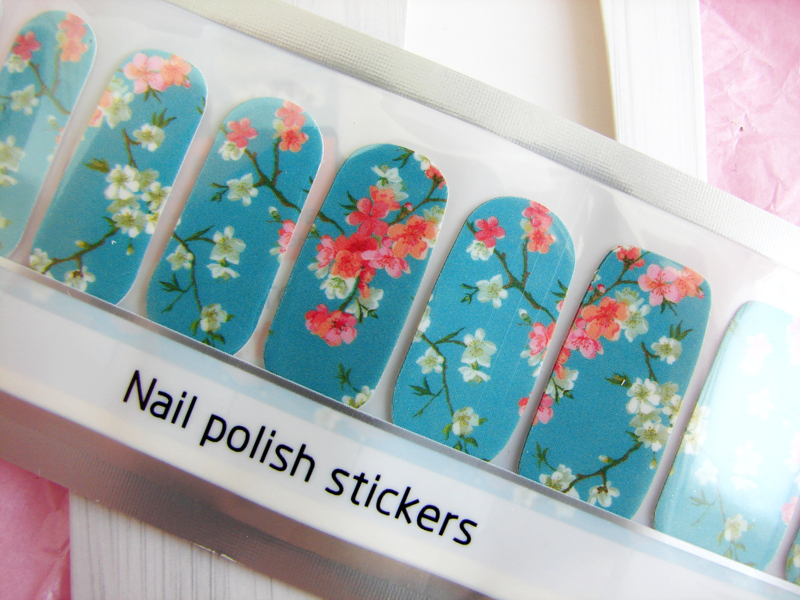 Are you a nail wrap lover? If so, which brands are you a fan of?